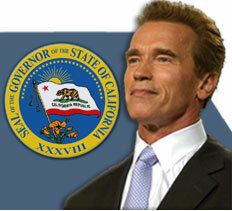 Governor Schwarzenegger got some bad press over the weekend for comments he made on the Howard Stern Show. The former body builder and action star advocated the destruction of the moon. "If we get rid of the moon, women, whose menstrual cycles are governed by the moon, will not get PMS. They will stop bitching and whining." Actually, it was a (dead-on) Arnie-impersonator, who has been calling in to the Stern Show for years. Many people missed the joke. This was The Ottawa Sun's Quote of the Week, made the news in both Great Britain and India, and of course surfaced in the blogosphere here at home. Awesome, right? That story actually made me feel a little less retarded for believing the Louis Armstrong/Britney Spears thing. You should also note that in the same show, Howard "reported" on a really stupid 911 Burger King call. said Jellio on May 3, 2005 10:01 AM. said Scaramouch on May 3, 2005 11:09 AM. Reminds me of the classic Mr. Show skit where NASA announced their plan to blow up the moon for no good reason and it caused a great national debate. "We're spending all this money, millions of dollars, to blow up the moon, when there are so many things here on Earth to blow up ... Mount Everest, the North Pole, et cetera. We're earthlings, let's blow up Earth things!" said Evil Richard on May 3, 2005 11:42 AM.